LONG BRANCH – A powerful Nor’ Easter wreaked havoc along the beach just beyond the doors of the Ocean Place Resort where Bishop Schol sat studying his sermon notes one last time. The frothy waves rolled violently in a mist of gray as a howling wind rattled the windows. Across the hall, more than 250 clergy and their families took their seats, gathering for the 2017 Bishop’s Clergy Convocation; a three-day retreat of learning, growth, and for this year in particular, soul-tending. “The weather outside is a lot like our world today,” Schol said, addressing the crowd. “It’s also much like the church; turbulent with waves, foaming at the mouth at times,” he said through a smile, rousing laughs. Rev. Susan Beaumont, an adviser, author, coach and spiritual director who has consulted with over a hundred congregations and denominational bodies across the U.S. and Canada, was the plenary speaker with the theme of “Soul-Tending.” She believes the soul is the authentic and truest self of the institution and the source of its divine calling and character; the protector of institutional integrity. Beaumont spoke about the church living in a season of liminality, where an old era and way of doing things has ended, and something new has not yet begun. She discussed the need for a different kind of leadership presence in a liminal season that connects the soul of leaders with the soul of the institution. “During liminal seasons, we occupy space on both sides of a boundary or threshold,” Beaumont said. “We have one foot rooted in something that is not yet over, while the other foot is planted in a thing not yet defined, something not yet ready to begin.” She went on to talk about functioning with structures, identities and relationships formed by past experiences while knowing that those structures and processes will not serve adequately in the future. “Liminality is more than people in new roles, or organizations going through transition,” she said, describing it as the state of developing. Convocation included small group sessions to help unpack the idea of institutional soul tending. Through small groups, clergy entered a three-way conversation engaging God, the soul of the leader and the soul of the organization. Clergy learned about inviting innovation and fostering the creativity that springs from the soul of the institution to deepen capacity for discernment. Beaumont believes tending the soul of the institution requires risk-taking, adaptation, innovation and creativity. In an adjacent ballroom, Maestro Roger Nierenberg met with a group of musicians he had hired for Convocation. It was his first meeting with this group and they ran through a 30 minute practice. Nierenberg, a former Music Director of the Stamford Symphony in Connecticut and the Jacksonville Symphony in Florida, leads a unique experience called The Music Paradigm. 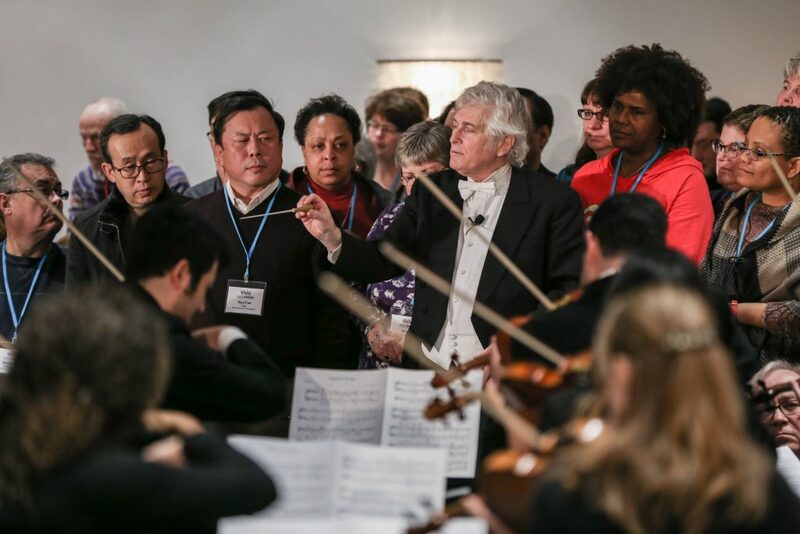 Since 1995, hundreds of corporations and organizations in 23 countries have engaged The Music Paradigm to mount sessions for their employees where audience members are also participants, seated within a live professional orchestra where they observe highly trained musicians perform. Each session is unscripted and authentic, uniquely customized to create a lasting impact and unforgettable memory. He praised the orchestra’s ability to trust and value each piece, acknowledging that every member played an important and vital role regardless of where they were positioned. From his perspective as the conductor, Nierenberg could grasp the full picture. “The ability to believe in what’s possible is what makes the orchestra,” he said. Nierenberg invited clergy to stand anywhere in the room to see the musicians from any perspective they felt most comfortable. Many joined him on stage and saw how each piece was vital to the whole performance and how they were vital to the story. “The quality and investment made in the entire experience made me feel deeply cared for and appreciated by our bishop, staff and entire annual conference,” said Rev. Joe Monahan of Medford UMC. In his closing Communion Liturgy, Schol thanked God for drawing clergy back to the source of the music, acknowledging God as a trustworthy maestro. As Convocation came to a close, the raging storm dissipated, the waves quieted to a smooth green lapping, and sunlight emerged leaving a bright calm and tended souls.